Apr 14 NO ROAD, NO VOTE is the slogan shouted by villagers of Darupisa for Lok Sabha polls. Darupisa village falls under Gram Panchayat Dokda where people are boycotting elections scheduled on April 23 for not getting road connectivity. Besides, entry of any political leader has also been restricted in the village. As per information, Darupisa village is still eyeing for development. People are fed up with demanding basic amenities since their plea fell on deaf ears. They are irked for wandering from pillar to post for road connectivity. Left with no option, villagers have now decided to boycott Lok Sabha polls. According to villagers, this was the only way to express their displeasure towards apathy of local representatives. 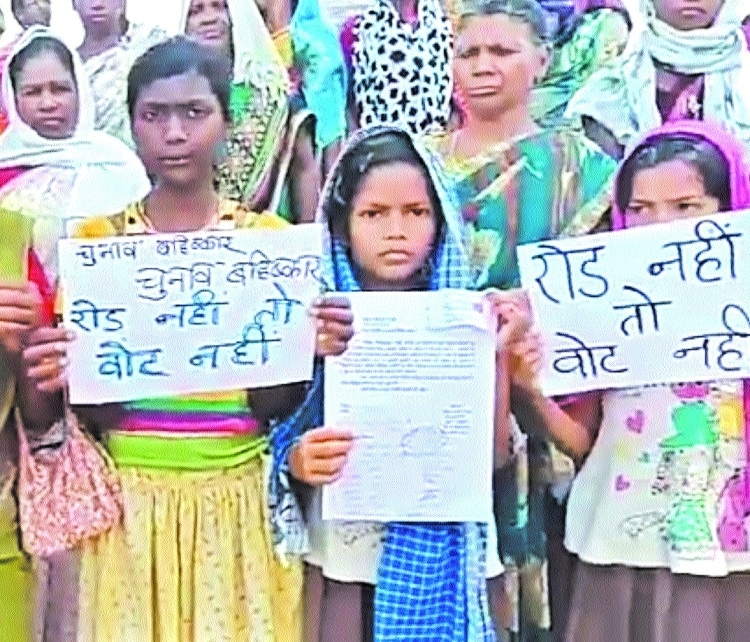 Villagers including women and children can be seen holding hand-made posters indicating ‘road nahi to vote nahi’. Further, one can also see banner fixed in village stating ‘boycotting elections’. The pain of being deprived of road connectivity was also visible on the faces of children, women and other villagers who were expecting a lot from public representatives.